Background: Meniere’s disease (MD) is considered to be a multifactorial disease. Although there are some previous reports on the relationship between MD and stenotic eustachian tube (ET), there are a few reports evaluating MD and patulous ET. The study aimed to investigate whether MD would have patulous ET or not. Methods and Findings: Sonotubometry was performed in patients with MD and healthy controls and the results and their correlations with hearing levels were assessed. 23 of 45 (51.1%) subjects in the MD group were diagnosed with eustachian tube dysfunction. 12 ears (26.7%) were diagnosed with “a stenotic tube type” and 11 ears (24.4%) were diagnosed with “a patulous tube type”. There was a significant difference between the MD group and healthy volunteer group in the variance of duration. The ratio of MD patients in the subjects showing patulous ET type (duration more than 899.2 ms) was significant higher than healthy controls. The mean amplitude and duration of the MD group were significantly higher than that of healthy controls. There was no significant relationship between ET function and hearing levels and vertigo attacks. Conclusions: The findings of this study suggest that the patients with MD have not only a stenotic ET but also a patulous ET. Meniere’s disease (MD) is characterized by recurrent vertigo attacks, low-frequency hearing loss, tinnitus, and ear fullness. Endolymphatic hydrops has been considered to be the histopathological etiology of MD. However, the precise mechanism underlying MD remains unclear. MD is considered to be a multifactorial disease, which includes genetic factors, psychological factors, autoimmune disease factors and allergic factors. Franz summarized that eustachian tube (ET) dysfunction and cervical spine, temporomandibular joint, and autonomic nervous system disorders have the potential to develop into secondary MD, and ET plays a critical role in the constellation . Here we have investigated the relationship between MD and ET function. In the first trial, MD patients were conservatively treated with medications, including diuretics, and diet control. However, some patients did not respond to these measures; therefore, in the next trial, surgical treatment such as endolymphatic sac surgery was attempted for these intractable cases. Middle ear overpressure treatment is a less invasive therapy for intractable MD. The long-term effects of this therapy on vertigo attacks in patients with MD have been demonstrated . It is administrated to patients using a Meniett device, which is a micropressure pulse generator. Micropressure pulses penetrate the inner ear via the external auditory canal, ventilation tube, and the round window and eliminate the debris in the vestibular aqueduct, resulting in an improvement in endolymphatic hydrops. It is occasionally effective only with the insertion of a tympanic ventilation tube, and previous study has demonstrated the effectiveness of tympanic ventilation tube insertion in MD patients . Therefore, ET function, which controls middle ear pressure, plays an important role in the pathogenesis of MD. Several previous studies reported no significant relationship between ET dysfunction and MD [4,5]. They investigated ET function using tympanometric methods in combination with pressure-altering methods. Although, in tympanometry, stenotic ET is easy to be detected, patulous ET is difficult. Furthermore, none of these studies conducted out specific ET function tests. Results of recent studies using sonotubometry revealed that MD is associated with ET dysfunction [6,7]. Sonotubometry is an acoustic method to measure the ventilatory function of ET. During sonotubometry, the ET opening is measured by recording changes in sound pressure levels in the external auditory canal when a sound is applied to the nostril using a microphone while the subject actively performs ET opening maneuvers such as swallowing. The standard procedure for sonotubometry has been previously described . It is a useful and easy routine clinical test to measure ET function. This study aimed to investigate the relationship between ET function and MD and compare ET function between healthy subjects and MD patients by evaluating ET function using sonotubometry. Forty-five ears of 38 patients [12 males and 26 females; mean age (±SD), 50±13years; range, 23-68 years], including 7 patients with bilateral MD (n=14) and 31 patients with unilateral MD (n=31) were included in the MD group. In addition, 62 ears of 31 healthy volunteers [11 males and 20 females; mean age (±SD), 47±11 years; range, 29-74 years] with no history of ear disease or vertigo were included in the normal group. No patient had a history of middle ear or nasal surgery. These patients were allowed to continue pharmacological treatment for the disease. There was no significant difference in background characteristics (gender and age) of the subjects between the two groups (Table 1). Patients were diagnosed with definitive MD according to the 1995 guidelines of the Committee of Hearing and Equilibrium of the American Academy of Otolaryngology-Head and Neck Surgery (AAO-HNS) . However, patients’ hearing levels were assessed using the worst pure-tone audiometry (PTA) threshold at frequencies of 0.5, 1, 2, and 4 kHz instead of the four frequencies (0.5, 1, 2, and 3 kHz) recommended by the AAO-HNS 1995 guidelines; the 3-kHz threshold is rarely used in Japan. PTA and the ET function test (sonotubometry) were performed for all patients. The equipment used in this study included a sound generator (frequency, 7 kHz; band noise), which was placed in the subject’s nasal vestibule, and a measurement microphone, which was placed in the subject’s ipsilateral external auditory canal (ET- 500, NAGASHIMA MEDICAL INSTRUMENTS, Japan). A sound was applied to the nostril using a sound generator, and sound pressure changes were transmitted to the external auditory canal during ET opening induced by swallowing. Sound pressure changes (amplitude, dB) in the external auditory canal were recorded by a microphone and assessed in terms of ET function. The time taken by the ET to open and close was recorded (duration, ms). If the duration was more than 1000 ms, we defined a measured value 1000 ms as the upper limit. If the amplitude did not increase above baseline levels and the duration could not be measured, we defined the measured value of duration as 0 ms and the amplitude as 0 dB. This study was performed in accordance with the Declaration of Helsinki. All procedures were approved by the ethical review board of the Shinseikai Toyama Hospital. We statistically analyzed the data obtained from the normal and MD groups using the F-test, Chi square test and Mann Whitney U-test with MedCalc Software (Ostend, Belgium). A P-value of <0.05 was considered statistically significant. To define the normal values of duration and amplitude, we first assessed the normal group. The mean (±SD) duration of sonotubometry was 384.2±257.5 ms (n=62) and the mean (±SD) amplitude was 8.3±6.0 dB (n=62), which were comparable with those in previous reports . Therefore, we defined the normal duration value as less than 899.2 ms (mean+2SD). Moreover, in line with a previous report , we defined a peak of greater than 5 dB as a normal response. An amplitude of less than 5 dB was considered to represent “a stenotic ET type”, whereas a duration of more than 899.2 ms was considered to represent “a patulous ET type”. On the basis of the definition, 13 (21.0%) healthy controls were diagnosed with ET dysfunction. Of these, 11 (17.7%) were diagnosed with “a stenotic ET type” and two (3.2%) with “a patulous ET type”. In the MD group, 23 (51.1%) ears were diagnosed with ET dysfunction. 12 ears (26.7%) were diagnosed with “a stenotic ET type” and 11 ears (24.4%) were diagnosed with “a patulous ET type”. Most of the healthy controls were distributed in the range of 200- 399 ms, and the distribution was nearly parametric. However, the MD patients were distributed unevenly to the range of more than 1000 ms. There was a significant difference (P<0.05) between the two groups in the variance of duration by F-test (Figure 1A). Most of the healthy controls were in the range of 5-9 dB, and the distribution was nearly parametric. Figure 1A: Distribution of patients with MD and healthy controls in terms of duration measured by sonotubometry. The vertical axis represents the number of ears (ears) and the horizontal axis represents the duration (ms). The ratio of MD patients in the subjects showing patulous ET type (duration more than 899.2 ms) was significant higher than healthy controls, while the ratio of MD patients in the subjects showing stenotic ET type (amplitude more than 5 dB) did not have significant difference compared to healthy controls (Figure 1B). 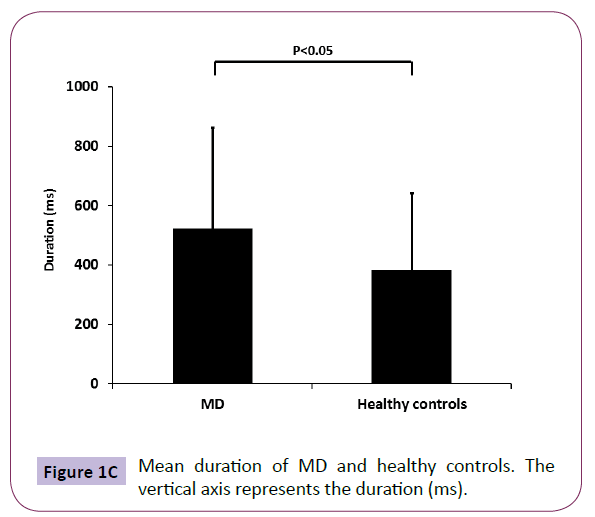 Also, the mean duration of MD was significant higher than that of healthy controls (Figure 1C). On the other hand, although the MD patients were distributed almost uniformly, and there was no significant difference in the amplitude (data not shown), the mean amplitude of MD was also significant higher than that of healthy controls (Figure 2). 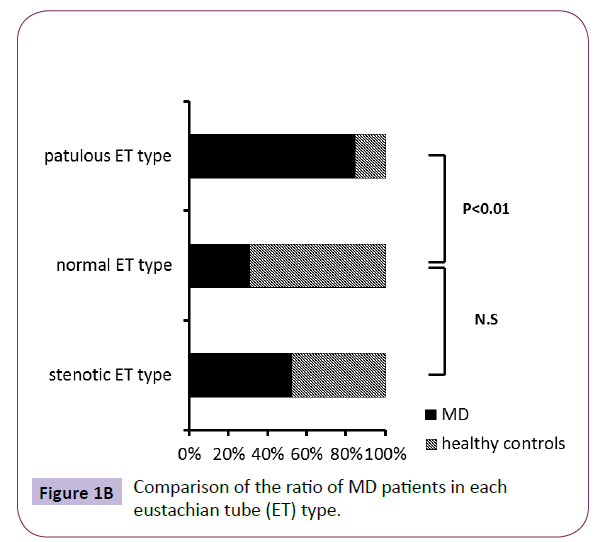 Figure 1B: Comparison of the ratio of MD patients in each eustachian tube (ET) type. Figure 1C: Mean duration of MD and healthy controls. The vertical axis represents the duration (ms). 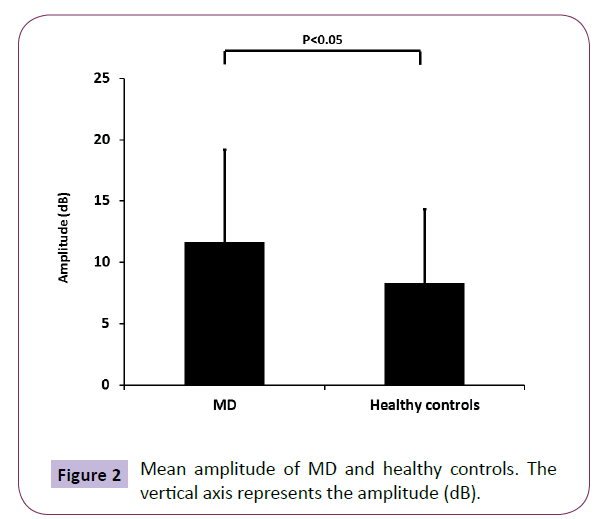 Figure 2: Mean amplitude of MD and healthy controls. The vertical axis represents the amplitude (dB). We could not detect any significant relationship between PTA threshold and sonotubometry duration or amplitude in MD group, respectively. There was no significant difference on vertigo attacks among normal ET group and ET dysfunction group in MD group (data not shown). In this study, we found that 21.0% healthy controls and 51.1% MD patients had ET dysfunction using sonotubometry. The number of MD patients with patulous ET type was significant higher than that of healthy controls with the same ET type. All previous studies that reported the relationship between ET function and MD found only stenotic ET in MD patients [4,6]. It is feasible to conclude that stenotic ET affects MD, considering that previous report documented that the release of negative pressure in the middle ear induces a decrease in endolymphatic hydrops in animals . However, our results suggested that a patulous ET was a contributing factor compared with a stenotic ET in the MD patients with ET dysfunction, while previous report mentioned that a stenotic ET was a dominant factor . The possible explanation for this difference is differences in disease severity and sample size in the MD group between our study and the previous studies. To clarify this further, we should investigate MD patients with or without ET dysfunction in further large samples after a clear classification of disease severity, including the frequency of vertigo attacks. In addition, the difficulty in arriving at an accurate diagnosis of a patulous ET may affect the results. In some patients, a patulous ET appears as a stenotic ET. Furthermore, sonotubometry may give false-positive or false-negative results, because patients with a severe patulous ET sometimes show like a stenotic pattern, which shows no curve on sonotubometry. Therefore, a patulous ET may be judged as a stenotic ET in such patients. For accurate diagnosis of patulous ET, we should perform a careful examination of the ear drum, which synchronously moves inward and outward with breathing. However, we may overlook a mildly patulous ET during macroscopic examination. Moreover, some patients with a patulous ET often lock their ET by sniffing to avoid ear fullness, and this action results in retraction of the tympanic membrane. Therefore, a patulous ET may be misdiagnosed as a stenotic ET if only an examination was ocular inspection of the tympanic membrane is conducted. To judge a patulous ET, careful consideration on the combination of ocular inspection, clinical history, test including tympanometry and sonotubometry is needed. We also cannot diagnose a patulous ET only by the result of “a patulous ET type” on sonotubometry, although indications of “a patulous ET type” on sonotubometry include an ET that is looser than a normal ET. We considered that sonotubometry was the best routine test at present. However, a novel approach to sonotubometry using perfect sequences (PSEQ) stimuli was found to improve sensitivity of detection of the ET opening . It remains unclear whether ET dysfunction is a cause of MD or exacerbates existing MD. A previous study reported that ET function correlates with hearing levels in MD patients . They described that ET dysfunction does not always cause the onset of MD; it may influence the hearing prognosis of MD. We could not detect any significant relationship between hearing level and sonotubometry results testing in this study. Further study is needed to conclude whether ET dysfunction affect the prognosis of MD. Previous studies have provided several theories on the effects of stenotic ET on the inner ear. Among these, hypoxia of the inner ear via negative pressure in the middle ear is a major theory. Negative pressure in the middle ear cavity is considered to occur when the ET is blocked in MD patients. In this condition, the oxygen tension in the middle ear, which is lower than that in the atmosphere decreases further . In patients with anoxia, an increasing in endolymphatic pressure  and the concentration of Ca2+ in the scala media  occurs concomitant with the decrease in endocochlear potential. When the middle ear pressure decreased, the perilymph pressure decreases via the round window, placing Reissner’s membrane under pressure and promoting the development of endolymphatic hydrops. Moreover, homeostasis in endolymph secretion and/or absorption is believed to be maintained by circulation hormones, including mineralocorticoids, atrial natriuretic peptide, and vasopressin. The presence of receptors for these hormones in the cochlea has been confirmed . Persistent negative pressure in the middle ear is considered to affect endolymph volume via these hormones. On the other hand, it remains unclear how a patulous ET affects inner ear function. There are two possible mechanisms. (1) Pressure changes through the ET shift the tympanic membrane, which moves oval window and affects endolymphatic fluid via ossicular chain . (2) Sound pressure changes through the ET conduct the thin round window membrane directly, which affects endolymphatic fluid via the perilymph. A previous study  explained that unphysiological movements of the round window (and oval window) can work like the membrane of a gasoline pump, leading to increased loss of perilymph either by diuretic hormones  (reacting to pressure) or through the cochlear aquaduct. A greater loss of perilymph results in subsequent enlargement of the endolymphatic space. Phonation and swallowing in dairy life causes fluctuations in the round window and oval window in the patients with a patulous ET. These frequent fluctuations may result in the loss of perilymph and cause secondary MD. Previously, an abnormal patulous ET has also been observed in patients with hearing loss  and vestibular symptoms . Indeed, we have experienced that treatment with a middle ear ventilation tube was effective in some patients with intractable MD, which can be associated with “a patulous ET type”. If fluctuations in middle ear pressure correlate with MD and a patulous ET, a tympanic ventilation tube may be effective by attenuating of the fluctuations in middle ear pressure. This suggests that ET dysfunction including patulous ET is associated with intractable MD. Therefore, we assumed that the insertion of a tympanic ventilation tube may be effective in these patients. It suggests that not only a stenotic ET, which causes persistent negative pressure in the middle ear, but also a patulous ET, which causes frequent but transient fluctuations in inner ear pressure, may cause the secondary MD and intractable vertigo. MD is a multifactorial disease, and various mechanisms may increase the volume of the endolymphatic fluid. Our results raise possibility that there is a relationship between ET dysfunction and MD and that ET dysfunction including patulous ET is one of the important mechanisms underlying MD. In conclusion, we have revealed the existence of intractable MD with patulous ET. We thank Ms. Miyaka Yamamoto, Sachi Tamai, Takako Maezawa and Chie Okawa for their technical support. Franz B, Anderson C (2007)The potential role of joint injury and Eustachian tube dysfunction in the genesis of secondary Ménière’s disease. Int Tinnitus J13:132-137. Huang W, Liu F, Gao B, Zhou J (2009) Clinical long-term effects of Meniett pulse generator for Meniere’s disease. ActaOtolaryngol 129:819-825. Park JJ, Chen YS, Westhofen M (2009) Meniere’s disease and middle ear pressure: vestibular function after transtympanic tube placement. ActaOtolarygol129:1408-1413. Forquer BD, Brackmann DE (1980) Eustachian tube dysfunction and Meniere’s disease: a report of 341 cases. Am J Otol1:160-162. Maier W, Ross U, Fradis M, Ritcher B (1997) Middle ear pressure and dysfunction of the labyrinth: is there a relationship? Ann OtolRhinolLaryngol 103:478-482. Kitajima N, Watanabe Y, Suzuki M (2011) Eustachian tube function in patients with Meniere’s disease. AurisNasus Larynx38:215-219. Park JJ, Luedeke I, Luuecke K, Emmerling O, Westhofen M (2013) Eustachian tube function in patients with inner ear disorders. Eur Arch Otorhinolaryngol 270:1615-1621. Virtanen H (1978)Sonotubometry. An acoustic method for objective measurement of auditory tubal opening. ActaOtolaryngol 86:93-103. Committee on Hearing and Equilibrium guidelines for the diagnosis and evaluation of therapy in Menière’s disease (1995) American Academy of Otolaryngology-Head and Neck Foundation, Inc. Otolaryngol Head Neck Surg113:181-185. Palva T, Martila T, Jauhiaien T (1987) Comparison of pure tones and noise stimli in sonotubometry. ActaOtolaryngol 103:212-216. Kimura RS, Hutta J (1997) Inhibition of experimentally induced endolymphatichydrops by middle ear ventilation. Eur Arch Otolaryngol 213-218. Di Martino EF, Nath V, Telle A, Antweiler C, Walther LE, et al. (2010) Evaluation of Eustachian tube function with perfect sequences: technical realization and first clinical results. Eur Arch Otorhinolaryngol267:367-374. Ingelstedt S, Jonson B, Rundcrantz H (1975) Gas tension and pH in middle ear effusion. Ann OtolRhinolLaryngol 84:198-202. Yoshida M, Lowry LD (1984) Hydrostatic pressure measurement of endolymph in the guinea pig cochlea. Am J Otolaryngol 5:159-165. Ikeda K, Kusakari J, Takasaka T, Saito Y (1987) The Ca2+ activity of cochlear endolymph of the guinea pig and the effect of inhibitors. Hear Res 26:117-125. Furuta H, Mori N, Hoshikawa H, Sakai S, Iwakura S, et al. (1994) Detection of hormone receptors in the rat cochlea using molecular biological techniques. Proc Sendai Symp 4:43-45. Robinson PJ, Hazell JW (1989)Patulouseustachian tube syndrome: the relationship with sensorineural hearing loss. Treatment by euctachian tube diathermy. J LaryngolOtol 103:739-742. Heermann J (1993) Predominance of left ear in Meniére’s disease, sudden deafness, inner ear damage, tinnitus and abnormally patent Eustachian tube. Ear Nose Throat 72:205-208. Meyer zum GA, Lamprecht J (1989) Localization of the atrial natriuretic peptide blinding sites in the inner ear tissue-possibly an additional regulating system. ActaOtolaryngolSuppl 468:53-57. Heermann J (1988)Unilateral patulous eustachian tube with tinnitus, inner ear damage, vertigo and sudden deafness-collagen injection. HNO 36:13-15.